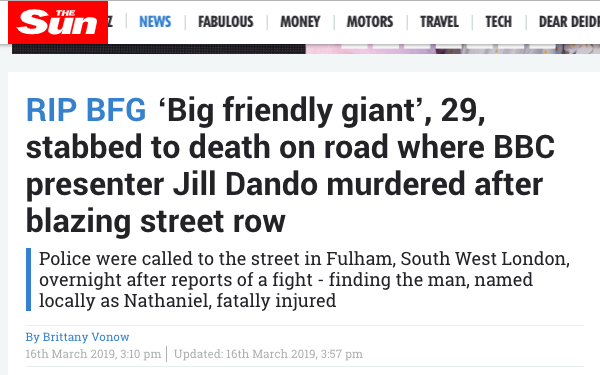 So how you report on the death of man in a fight in Fulham, south-west London? 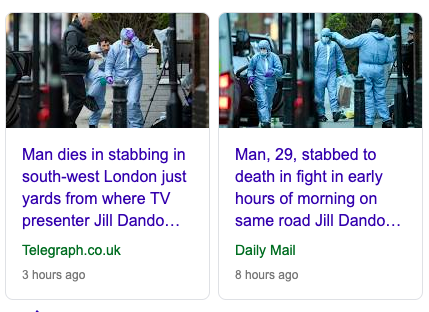 If you’re ITV News, you tell viewers that a 29-year-old man was stabbed to death “yards from where TV presenter Jill Dando was shot nearly 20 years ago”. Is that a line of enquiry? The dead man was not shot. He was stabbed to death in a fight. Jill Dando committed murder after a row? “Jill Dando murdered after blazing street row”. No. But who cares about journalism and facts when you can inject a celebrity element into a story of a young man losing his life?